Life Art and Blessing has always turned to nature, at the very core, for inspiration, reflection and relationship. RELATIONSHIP: the essence and deep meaning of all. Crystals are a daily part of the Creatrix of Beauty meditation, consideration, and natural, physical and elemental connection. There are literally thousands to consider, but these ones were a bang-wow-super-purchase. Left: Green Apophyllite with Stilbite. Right...as suggestion of the amazing Amethyst Phantom. 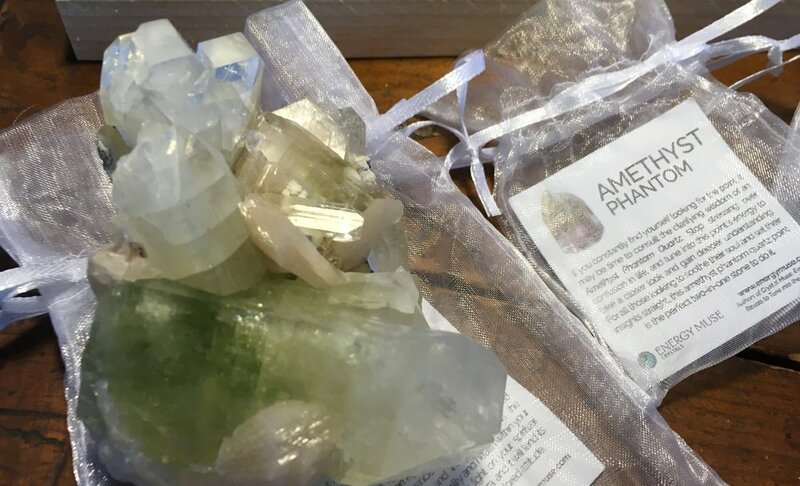 In connection with nature, the Green Apophyllite is an empowering steward—birthing forth that relationship. Take a spin: energymuse.com. These guys are so legit and lovely—you cannot go wrong here. There are many many ways to explore the crystals: I prefer in person, but living in a rural place, don't have too many options. Be sure to consider your sources carefully (that's Karma). Or check with a friend in the know. Ask us anything! We are endlessly curious.